Submitted by Norm Roulet on Tue, 11/16/2010 - 16:04. DAYTON, Ohio (WDTN) - Dozens gathered at the courthouse steps in downtown Dayton on Saturday, to push for laws to legalize medical marijuana. There was an important public health and social justice activist gathering in Ohio, this past weekend - groups supportive of legalizing medical marijuana in Ohio gathered at Courthouse Square, located at the corner of Third and Main Streets in the heart of downtown Dayton in support of H.B. 478, Ohio’s Medical Compassion Act that will allow for the medicinal use of cannabis. I don't know if this was reported in Cleveland, but television in Dayton certainly picked up the story. The clip embedded above is from channel 2. DAYTON -- Hundreds gathered in Courthouse Square to sing the praises of medicinal marijuana...including Niki Wilkerson who says it's done wonders for her health condition. "I don't feel like popping 10 or 15 pills a day and the fibromyalgia is unbearable at times, it brings me to tears," she says. "So I'm here to support herbal medicine and the only thing that helps that pain." The crowd is championing House Bill 478 which was introduced earlier this year. It would make Ohio the 15th state in the country to legalize cannibus to help treat things from cancer to Crohn's Disease. "We're here to show our frustration to our legislators for treating us like criminals when we're not," says advocate and medical marijuana patient Tonya Davis. She feels lawmakers should do more research. "Ohio...especially Dayton, has a big addiction rate with methamphetamine, heroin, cocaine, crack," she said. "They should be worried about that and make marijuana offenses the lowest priority." Some Ohio legislators do support the concept of medical pot but say this bill has missing parts that can't be ignored. But Davis says those who need the drug's benefits can't wait. "You know, there's a lot of people that are dying for making a choice that, literally, is safer than alcohol." The rally was hosted by the Ohio Patients Network and the Miami Valley chapter of the National Organization for the Reform of Marijuana Laws. Saturday, Nov 13, from 12:00pm- 4:20 PM groups will gather at Courthouse Square,located at the corner of Third and Main Streets in the heart of downtown Dayton in support of H.B. 478, Ohio’s Medical Compassion Act that will allow for the medicinal use of cannabis. Tonya Davis one of the organizers of the event is inviting cannabis community leaders from all over the state to be heard, “with 73% of Ohioans supporting the compa...ssionate use of marijuana, it is time we force our legislators to do what the majority of Ohioans want. We are urging everyone who can make it to attend a “informational event for Ohioans to learn about the Ohio Medical Compassion Act, what it means for Ohio’s patients, and what medical cannabis can do for those with chronic and debilitating medical conditions." Update: Representative Bob Hagan co sponsor of HB478 will be doing his best to make a appearance to speak to us unless he has to work on the railroad. VP of Ohio Patient Network which is involved with creation of HB478 Tonya is also a patient. 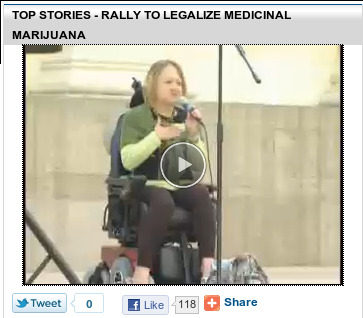 ♥ Cindy Wimer A patient, Activist and State Director with the WV American Alliance for Medical Cannabis. as we stand up for our rights. as we stand up to be heard. as we stand up for those who can not stand up for themselves. as we stand up for our medicine. For those of you thinking you might stay home.. Think about it this way...The way I look at it... this is no different than when the gay community came out into the light and said Hello we exist...!!! Would things have changed if you had stayed in the closet?Or what about the African american community? If Rosa Parks had not sat at the front of that bus and had just remained quiet and done as she was told and went to the back of the bus.. Where would we be today? How can you help? Well the following is what we still need so far. We also can vend because we are a non profit . We would like to have more folks vending or sponsors for this event. We need our friends/ members to tell everyone you know about this event. Submitted by Gone Fishin on Tue, 11/16/2010 - 20:11. My 50-year-old brother-in-law is dying and is only expected to live for another few months. On occasion he smokes marijuana, and I believe he should smoke more often. I prefer to see him happy, energized and in less pain- which is what happens when he smokes. When he is not smoking he is basically lifeless, sleeping, and in severe pain. I also believe that marijuana eases his fear of dying. When he smokes marijuana he does not mention his imminent death. When he is not smoking he constantly talks about his fear of dying. Even his physical appearance changes when he smokes. In my opinion, marijuana is the best medical treatment available to my brother-in-law. Marijuana should be medically available to all of those that are in the same situation. I prefer to see the benefits of 'illegal' marijuana versus 'legal' morphine. I would like to record his before/after reaction to marijuana so that everyone can really see the benefits of medical marijuana. It is unbelievable. Submitted by Tonik on Wed, 11/17/2010 - 16:59. Ok, how did the 'dozens' mentioned in the article at the link (and the accompanying video) get turned into hundredes in the headline here? Submitted by Norm Roulet on Wed, 11/17/2010 - 17:54. One channel reported 100s... another dozens. Submitted by Tonik on Thu, 11/18/2010 - 12:01. Submitted by Norm Roulet on Thu, 11/18/2010 - 12:23. Those seem to be OK - I know a few and they are some of the best writers in town. I suspect the ones on Prozac are a bigger problem. Cleveland Public Library Sports Research Center presents: "The Meaning and Process of Collecting Sports Memorabilia"